This was the one and only comic book to be found in a department store toy section that we visited. I have no idea whether it was a remnant of a broken-open 3-bag (there were no other 3-bags in evidence) or if it had come into the store somehow by accident. But beggars aren’t choosers when it comes to the opportunity to pick up a new book. Unfortunately, this issue of DETECTIVE COMICS turned out to be pretty forgettable. 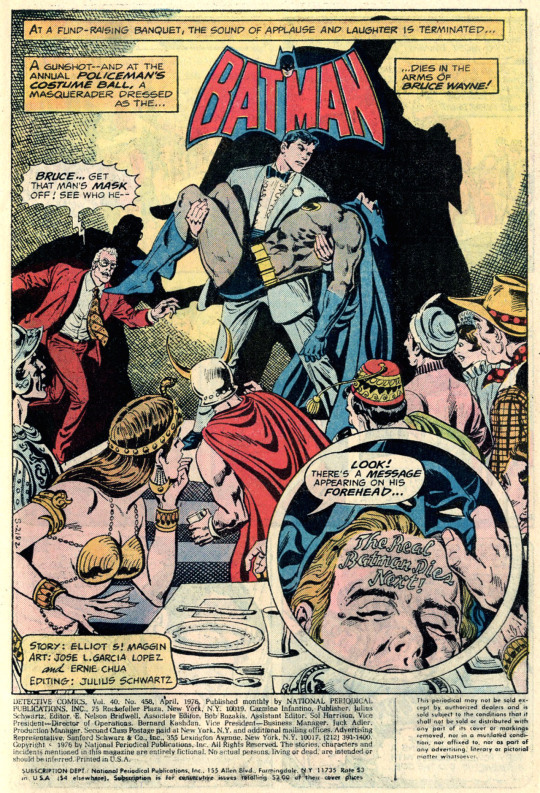 The story opens at the Policeman’s Costume Ball, where Bruce Wayne is MCing the costume contest. 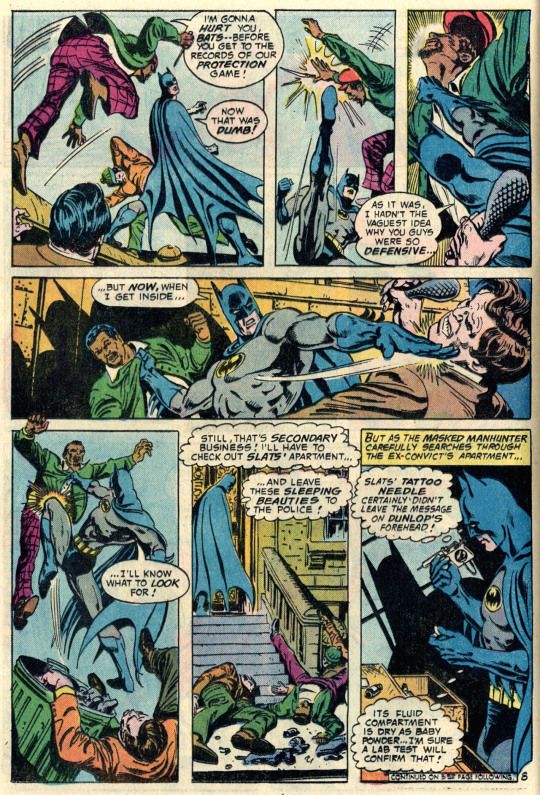 A gunshot is heard, and police Lieutenant Bucky Dunlop, dressed in a Batman costume, collapses into Bruce’s arms, dead. And when his cowl is removed, there’s a message written onto his forehead, warning that the real Batman is next. Commissioner Gordon locks down the hotel, preventing Bruce Wayne from leaving. Bruce instead gets a hotel room, then calls Alfred so that e can be patched into the Hot-Line when Gordon inevitably calls, which he does. This done, Batman swings out into the night to attempt to track down the killer. The story proceeds in very much a procedural fashion, as Batman dopes out that Dunlop ran a juvenile rehabilitation program for paroled offenders, assisted by an old ex-con friend Slats Johnson, who was also an expert tattoo artist. Since the message on Dunlop’s head was tattooed there in ink that would only become visible when his body temperature decreased to a certain point, that makes Slats the most likely suspect. Both Batman and Commissioner Gordon agonize separately about having to tell Edith Dunlop and her kids about her husband’s murder, which is a nice, humanizing touch. The true culprit turns out to be Charles Fellman, who also attended the costume party and who had also been previously caught by the Batman. 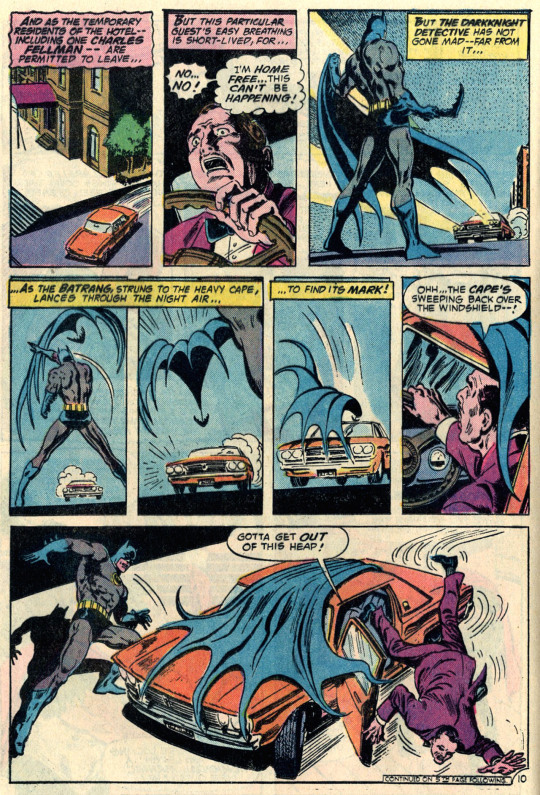 There is a cool two-page sequence towards the end where Batman stands in the path of Fellman’s escaping car, hurling his cloak onto the windshield in order to cause it to crash, then races through a hail of bullets to kayo Fellman, the gunman’s shots going wild due to how scary and imposing the charging figure of Batman is. And that’s pretty much a wrap on this lead adventure. 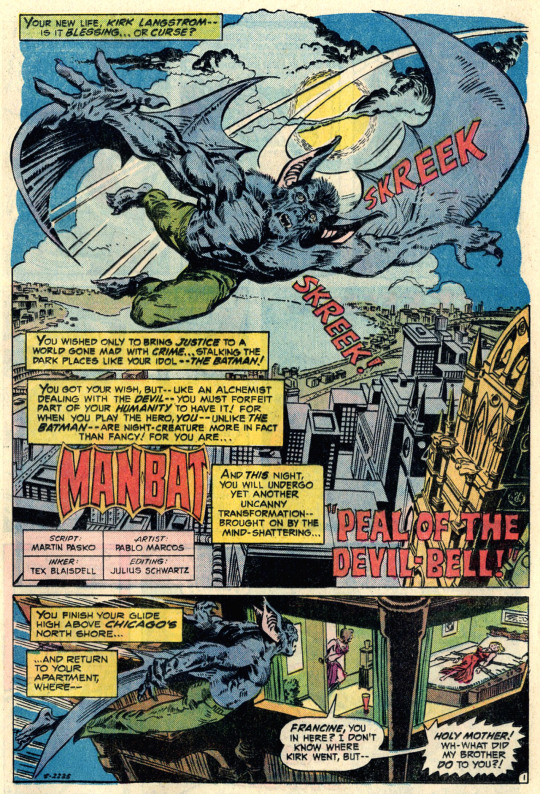 The back-up is a solo story featuring Man-Bat, a character who achieved a great deal of attention and notoriety from his initial three-issue Neal Adams-illustrated debut, and whom DC tried unsuccessfully to parlay into a headlining character. 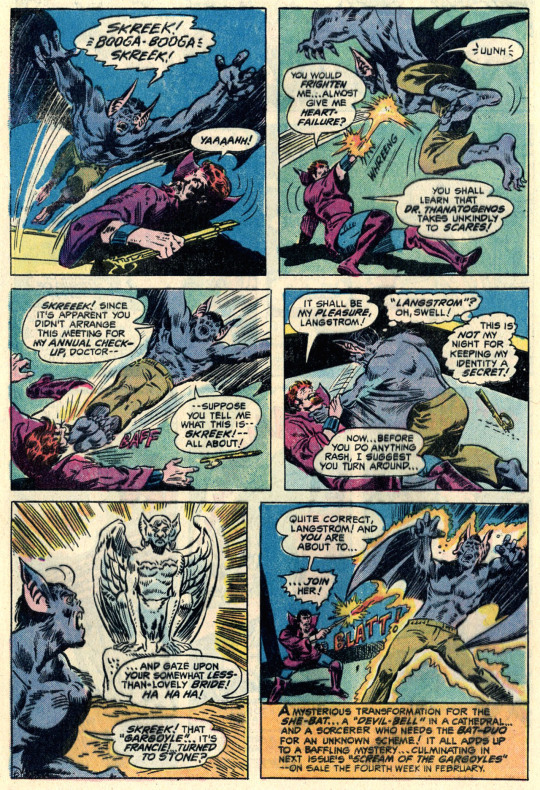 I suspect that this two-part story may have been commissioned for the never-published third issue of the MAN-BAT series, though I have no proof of this other than that it picks up on story threads from those issues, and the pacing on it is a bit wonky. 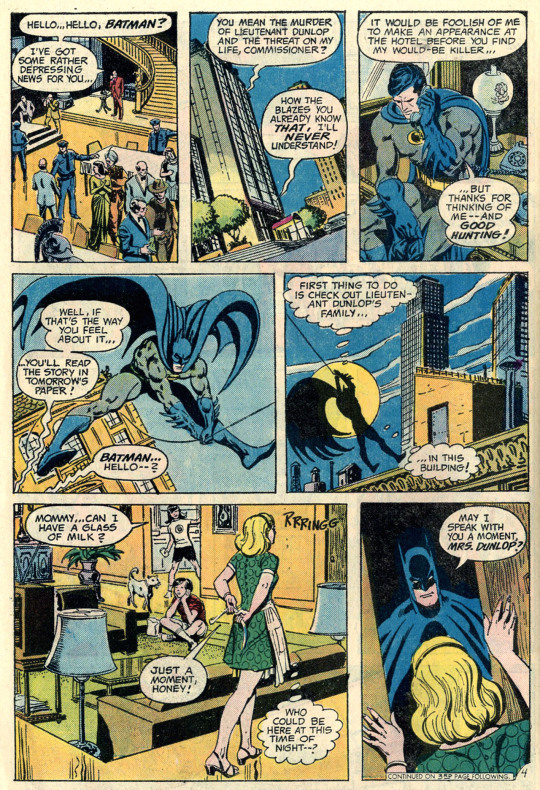 The story opens with Kirk Langstrom’s sister Britt coming upon his wife, Francine, strapped to her bed–a necessary precaution due to her uncontrollable transformations into the She-Bat. Man-Bat arrives in time to give his sister the lowdown on his origin and what’s happened to Francine–but the sorcerer Dr. Thanatogenos sees the Bat-duo as the keys to getting out from under his own curse of being turned to stone. He causes Francine to fly to him. Man-Bat follows, there’s a short scuffle–and Man-Bat is shocked to find Francine having been turned to stone, and Dr. T is able to get the drop on him. To Be Continued! I never did read the second half of this story, but I’m sure everything worked out fine for Kirk and Francine.